A new downloadable tutorial in this ongoing series is now available to purchase and download. 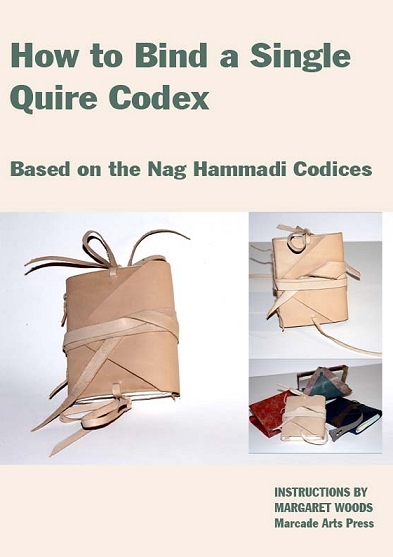 The design and pattern for this book is based on the 'Nag Hammadi' codices. These ancient gnostic texts were discovered in Egypt in 1945 near the small village of that name. The author has not attempted to make an historically accurate facsimile. Instead Margaret Woods has tried to create a book with the 'flavour' of the originals. Her interest lies in adopting and adapting old binding methods to make artistic and useful contemporary books. The original books were fairly large, about 29 x 18cm (11.5 x 7ins) and would have taken a whole hide of goat or sheep to make. I decided to use about half a shoulder of vegetable tanned calf skin and make my book about a quarter of the size: around 12 x 10cm (5 x 4ins). This tutorial is suitable for anyone with general craft skills in measuring, cutting, sewing, etc. The book is sewn with 'direct tacketing' which means you can undo the binding and replace the paper quite easily. The tutorial is fully illustrated with printable templates, photographs and diagrams.